Martin, if all this is what I think it is, there is someone very dangerous standing right behind you in the dark, breathing down your neck. Author Andrea Codrington discusses the opening titles for Nightwatch, from her 2003 book Kyle Cooper: Monographics. 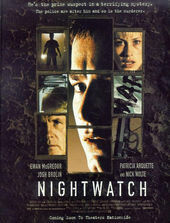 Yet another story about a serial killer, Nightwatch provides fuel for the ﬂame of Cooper's obsession with eyes. For this ﬁlm about a serial killer whose hallmark is removing the eyeballs of his victims, Cooper scratches or cuts out the eyes on a series of photographs of young women. This approach, though simple, effectively references the reduction of human to corpse, the spirit having vacated the body in death. An added layer of distance is added by submerging the photos in water, which ripples spectrally on the screen. The type, which is projected onto the water, comes in and out of focus, layered on top of eerily glowing live-action images from the TV coverage of the most recent murder, which segues into the narrative beginning of the ﬁlm.